The premise of this article and the next one I’ll post here on The Diary of an Improvateur (next week) began with a rather capricious question: how would it feel to decorate Hampton Court Palace, a jewel in the Tudor King’s built crown, in a way that if the luminaries in Henry VIII’s court were alive today they would applaud? I’m going to attempt to give the courtiers a nudge in the right direction, a theatrical mis-en-scene for their machinations, so stay tuned! Today, I’m setting the scene with a bit of backstory about the historical castle. It’s no exaggeration to say the estate has one of the most storied histories a property could possibly have given it is one of the greatest surviving medieval palaces in the world. The original building was the pinnacle of style when it was first constructed by one of Henry VIII’s most trusted advisors Cardinal Wolsey (until he wasn’t, of course; H8 pushed the exit button with anyone who didn’t give him what he wanted, and that turned out to be just about everyone!). 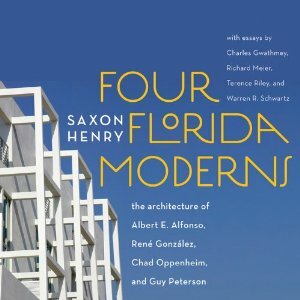 When the cleric began constructing the medieval façade in 1515—a smooth 500 years ago—he couldn’t have guessed it would become one of Henry VIII’s most prized summer playgrounds. But in 1528 it did, and the King set about rebuilding and expanding it (at a sum that would be equal to £18-million today). The Baroque South and East Fronts of the palace from the Great Fountain Garden. Further expansion took place when William III and Mary II commissioned a substantial Baroque addition designed by Sir Christopher Wren—a built environment so extensive it could have been an entirely separate palace in its own right. A painting of William and Mary; image courtesy WikiMedia. The estate also served as the royal home of George II and Caroline during their reign. In case it escapes you, this constitutes slices of the House of Tudor, the House of Orange and the House of Hanover in one monarch-laden mélange! 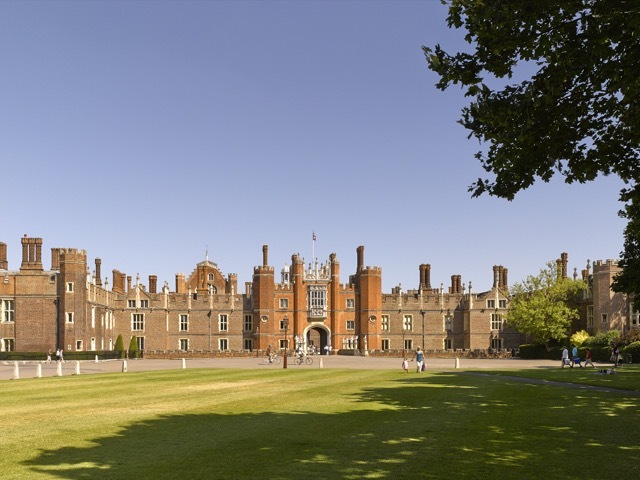 I learned quite a bit about the storied architectural gem by watching the PBS documentary Secrets of Henry VIII’s Palace, and I have the property on my list of places to visit the next time I’m on a literary adventure in the UK. Two trend-worthy facts stood out as I scribbled notes: the red bricks used to clad the original medieval façade were the hot material of the day, and the Great Hall birthed the term eavesdropping due to the carved and painted figures earnestly watching from the eaves. 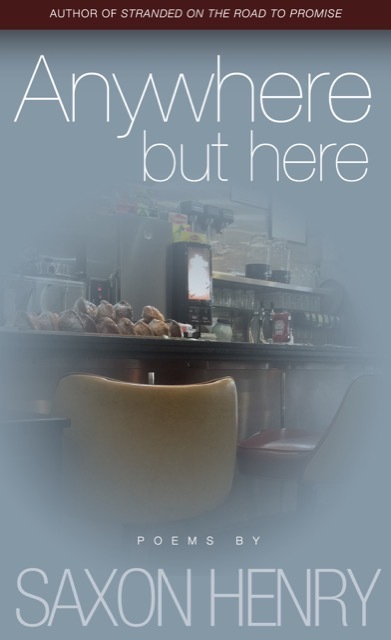 The architectural elements were placed there to remind diners they were being observed so they’d better behave. How is that for a noteworthy literary design mash-up? 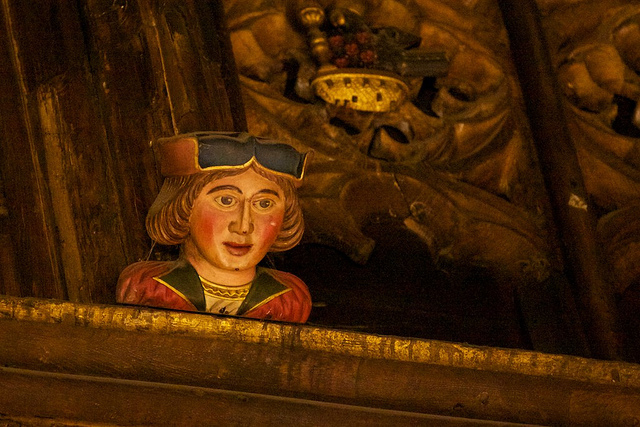 One of the eavesdroppers ornamenting the ceiling beams in the Great Hall. 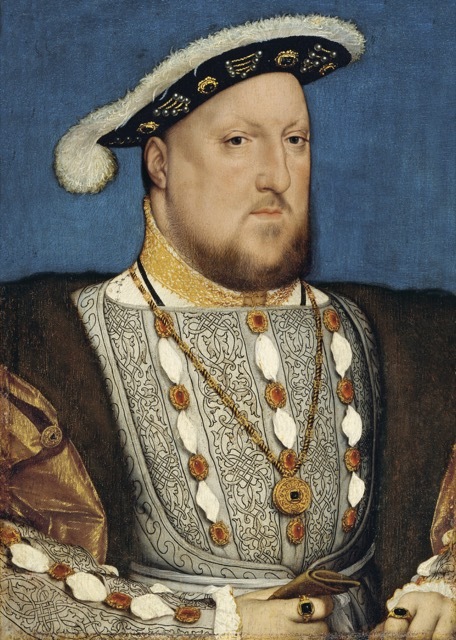 Henry VIII received the palace as a “gift” from Wolsey when the Cardinal couldn’t convince the Pope to grant the King a divorce from Catherine of Aragon so he could marry Anne Boleyn. Wolsey was hoping the relinquishing of his beloved palace would appease Henry but fat chance anything would calm him down since he wasn’t getting his way, and Wolsey was the perfect scapegoat. Speaking of fat (and, now that I think about it, goats): the provisions for the kitchen each day Henry was in residence would have filled a veritable supermarket given there were 600 to 1,000 people to feed during each sitting. The King spared no expense as the feasts for the Tudor court routinely lasted for seven hours or more! 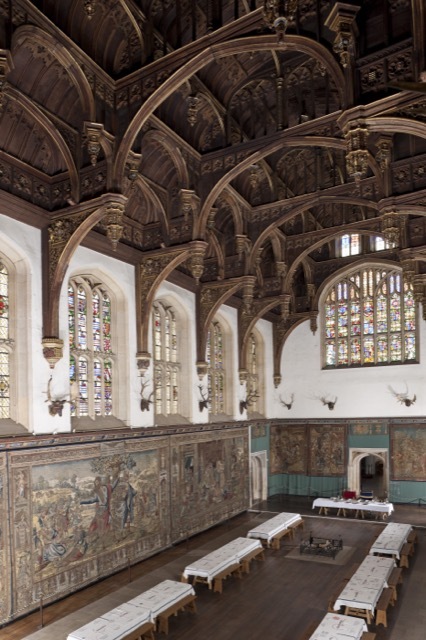 Henry VIII’s Great Hall deliberately invoked medieval ideals of hospitality. Those meals were prepared in the largest surviving Renaissance kitchens in Europe, and roasted meat was at the heart of each and every one of them (this makes the King’s substantial girth makes sense, doesn’t it?). Six fires would be burning in every roasting room to prepare for these grand productions when the court descended, and the servants minding the spits described their workstations as mortal hell. Hard to believe there was an upside to their jobs, but one existed: they were the only help allowed an unlimited amount of beer each day. It’s shocking anyone’s rations were restricted given the palace was known for racking up orders of 600,000 gallons of the liquid refreshment each year, the majority of which was consumed when the courtiers were present. 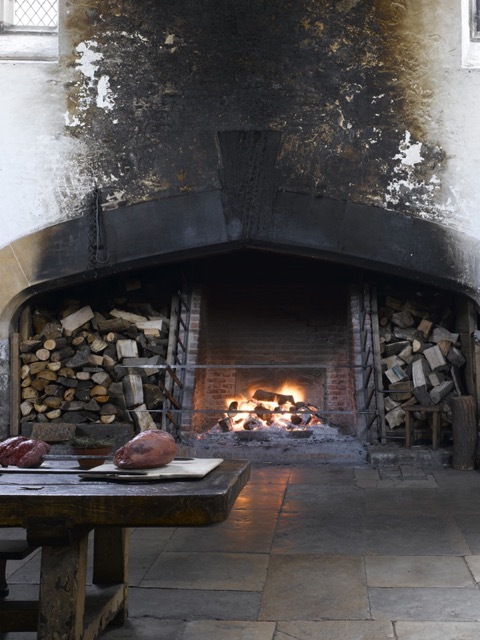 Great roasting fire where meat was cooked on a spit at Hampton Court Palace; image © Historic Royal Palaces. 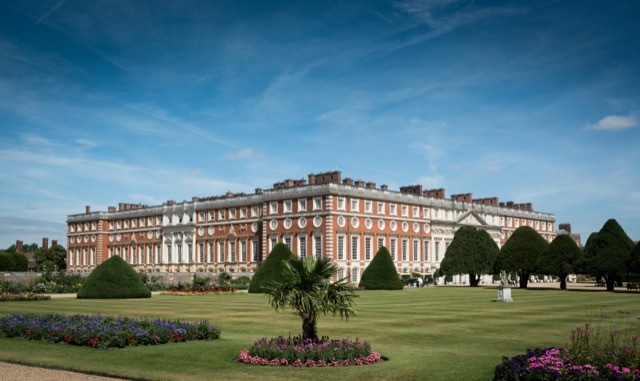 Hampton Court Palace was only one of between 50 and 60 palaces Henry reportedly owned, his habit of scampering around the countryside with at least 100 courtiers in tow a favorite pastime. It just so happens this one locale saw ample proof of his disregard for the rest of humanity. It was in the Great Hall, for instance, where he first danced with his second wife Anne Boleyn and we see where that got her. The Haunted Gallery is named such because it is reportedly the restless domain of the ghost of Catherine Howard, his fifth wife, who was charged with adultery and placed under house arrest there. 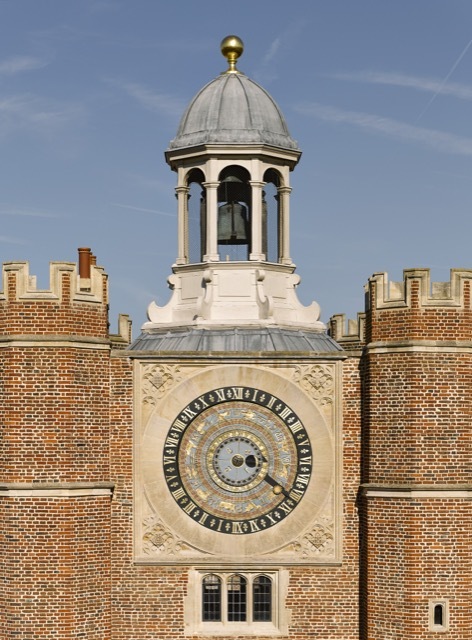 The Astronomical Clock on Anne Boleyn’s Gateway, tick-tock, tick-tock; your time will come as well! As the story goes, she was imprisoned in her chambers at the palace when Henry determined she would be the next to exit stage right but she managed to escape and run along the gallery to the chapel where the King was at mass. Before she was able to reach him, she was seized by the guards and dragged, screaming, back to her rooms. It is said that her ghost still shrieks along the gallery from time to time. Charming, no? 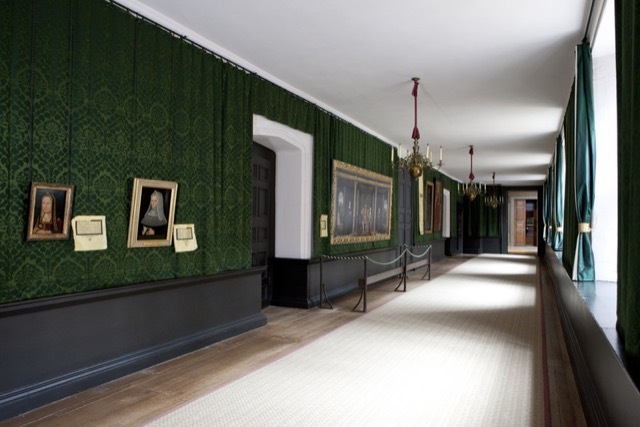 The Haunted Gallery, looking south; image © Historic Royal Palaces. 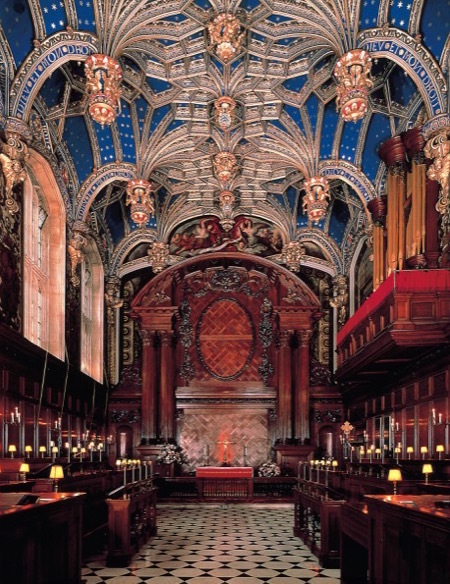 The heart of Jane Seymour, Henry’s third wife, is supposedly buried beneath the altar in the Chapel Royal—a fact I would have a tough time forgetting if I were to take communion in the spectacularly designed space with its intricate painted, gilded and varnished ceiling. The Chapel Royal at Hampton Court Palace has been in continuous use for over 450 years: the vaulted ceiling was installed by Henry VIII in 1535-6. Credit: Historic Royal Palaces/newsteam.co.uk. As you will see in my next post, I have chosen signature pieces that I believe would have brought a smile to Henry’s lips and pleased at least one of his six wives (the pretense that one would have survived to witness a present-day redecoration included in my ruse!). Were she managing a renovation on par with her original grand addition today, I could see Mary nodding her head in approval, too. 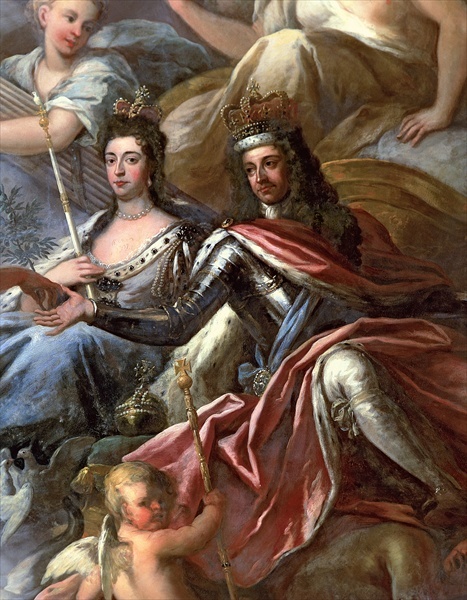 To represent George’s reign, I’m tapping one of his mistresses, Henrietta Howard—the Countess of Suffolk—to be our connoisseur representing his reign. Why would I choose one of the King’s mistresses over the Queen? I’m quite sure Caroline would be more interested in the Royal Chocolate Kitchen and the Chocolate Room by now so I’ve decided not to distract her from her desire for death-by-desserts. 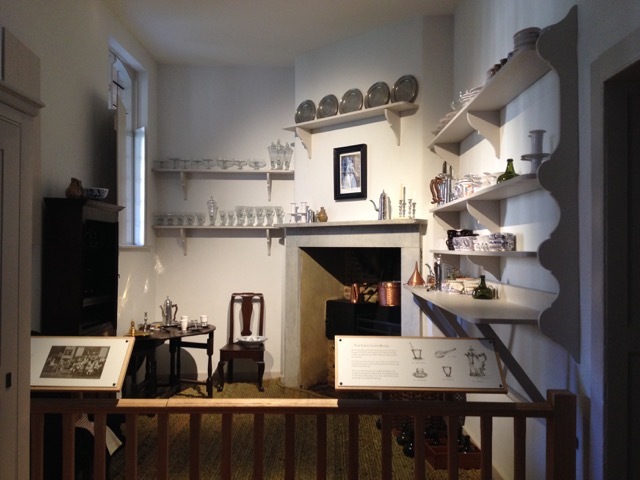 The Chocolate Room dressed with ceramics, copper cooking equipment, bespoke chocolate serving silverware, and period glassware and linens; © Historic Royal Palaces. I’ll be leaving these later monarchs out of this initial furniture fantasy, focusing only on the Tudor era with a dashing courtier as the central figure in my dramatic pretense. Imagine how much fun the eavesdroppers are going to have watching Henry VIII’s courtiers interact with the furniture I’ll put in place! I wager he inspires the same in many of us—all these centuries later as his legacy remains one of the strongest in kingly history. We’ll dally at putting some furniture under that awe in next week’s DesignLabs post so I hope you’ll stop back by. 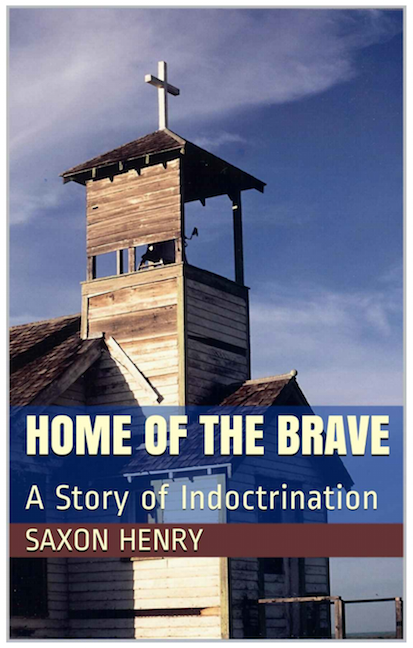 And as summer comes to a close, I highly recommend Weir’s book for your summer reading list if you have room on one more title. The Modern Salonnière and Decorating Hampton Court Palace © Saxon Henry, all rights reserved. 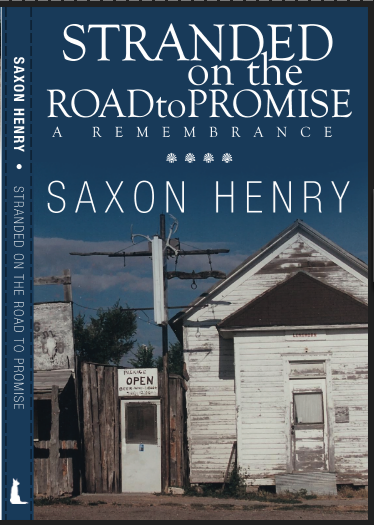 Saxon is an author, poet and strategist whose books include Anywhere But Here, Stranded on the Road to Promise and Four Florida Moderns.